Hello everyone. No Mycroft Journal this week, as our game doesn’t properly start until next Wednesday. There is one further journal entitled “The Summons” written which covers the aftermath of Journal 3 and summons to court, however I have postponed it until next week In the meantime here is a blog about a piece of software I use and how it helps run RPG. A few years back, I discovered a piece of software that many writers use for producing their novels and whatnot, and being a student of creative writing I decided to get it as well. The software is called Scrivener, and the reason I am telling you this is because it is one of the best tools I have available to me as a Gamesmaster and I wanted to share with yourself. I will be using World of Darkness RPG examples, but the basics apply to any game. Scrivener, available HERE, is a virtual ring binder, word-processor, and corkboard for want of a better description. It is intended for use by writers to create folders where they can house every draft of every chapter, have hyperlinks embedded that point at important information and a corkboard so that you can move your plot events about with ease. As you can imagine, there is a lot of utility in this with regards to RPG. One thing sure to kill the mood of any given game is having to stop mid-flow to check various rules. We all know it happens, there are just too many powers and spells and such for any mere mortal to reasonably recall the rules for all of them, so I created a powers database in Scrivener. This requires time, and a bit of patience, though if you are binge watching something on Netflix, then do it whilst you are doing that. You will need PDFs of the rules. In that folder, right click and upload file. Select the image of the rule. Related to having a powers database, having character sheets with the relevant powers hyperlinked on them saves time when you trot out your villain and want to start causing a bit of mayhem. Obviously, no program in the world will make the character history for you, but if you have that and some stats, you can easily copy and paste hyperlinked powers onto the character sheet, as at the end of the video. 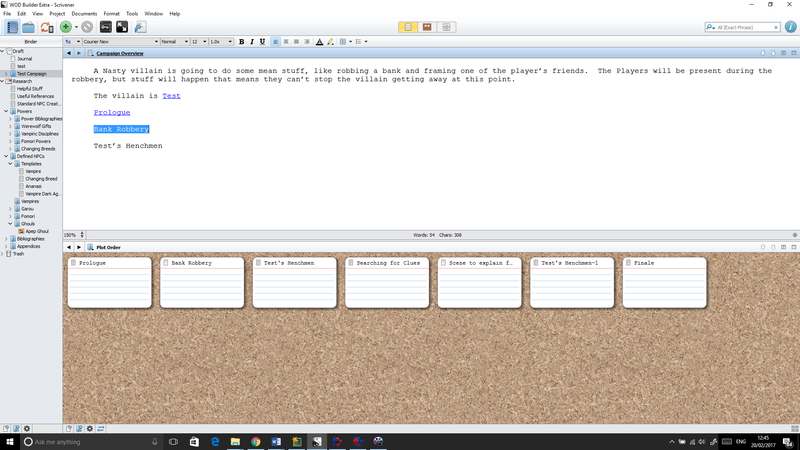 Using Scrivener to plan a chapter or a campaign is pretty straightforward. It relies on the hyperlinks, but also makes use of the corkboard feature which allows you to move important scenes around in your documents without having to rename and save. Watch the following video to get a better idea. A blog I wrote on my hobby site, about a piece of software I use for writing and running adventure games. Enjoy! This is a fantastic resource! Definitely will be checking it out for the next story I write 🙂 Thanks for sharing!